About Us | Whis-Purr Rescue, Inc.
Whis-Purr Rescue, Inc. is a 501c3 nonprofit California corporation newly founded in September 2013. We are Whis-Purr Rescue, Inc., a new 501c3 not-for-profit corporation dedicated to helping our feline friends. There are hundreds of strays, ferals and abandoned cats in neighborhoods in the community. Whis-Purr Rescue will work with these families, helping them find a lost cat’s home, trapping a feral, neutering and releasing back into the neighborhood where they can live and be fed daily or taken in to Whis-Purr Rescue for warmth and tender loving care until they can find their very own home. There are so many cats and kittens on the streets, not knowing that there is something so much better for them, a chance for a real life with a real family. They are in “survival” mode, trying to stay alive. They are cold and alone, but not for long… Whis-Purr Rescue, Inc. is committed to helping to change this in the local community to provide them consistent care, shelter, food and companionship and find them a “forever” home. To offer a hand up and the care and patience to see these precious little lives through until they find their own homes, For Whis-Purr Rescue, Inc. knowing that each cat and kitten they take in is safe and sound and hearing back from adopters their sweet stories of their new family members is what makes working in rescue all the more worthwhile. Whis-Purr Rescue, Inc. works with the community and partners with other rescues to trap, neuter and release ferals, helping with the overpopulation of cats in the local neighborhoods. 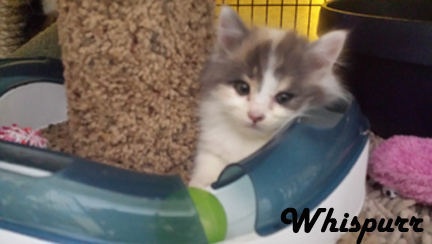 Whis-Purr Rescue, Inc. works with families in the community with their feline behavior issues in the hope of a greater outcome and less surrenders back to rescues and to shelters where they may be euthanized. Whis-Purr Rescue, Inc. is currently developing an informational resource and evaluation tool for landlords to help in the decision making process of allowing a cat friend to remain a part of their tenant's family. Whis-Purr Rescue, Inc. helps families in financial crises by putting them in touch with resources that could enable them to keep their extended animal family intact. Whis-Purr Rescue, Inc. has begun the process of setting up a long-term senior cat foster network. Won't you join Whis-Purr Rescue in the efforts? Donate, Foster, Volunteer and ADOPT today!